Southpeak just sent over a review copy of its DS horror game Dementium II, with a mysterious message attached. 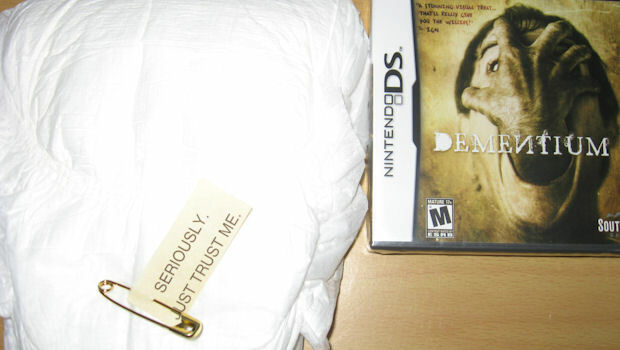 As you can see in the above image, it came packed with a diaper and a label that reads, "Seriously... just trust me." Whatever could Southpeak mean? From what I know, Dementium II is a whimsical and adorable adventure through a jellybean forest starring a bright pink bear called Mr. Cuddles. I have no idea why I'd need to wear a diaper for that. Weird. Anyway, me and Mr. Cuddles are going to take a stroll through the marshmallow fields, so we'll be back with the full review later. In the meantime, check out our contest to win a copy of the game and some fancy headset!